All living beings desire to be happy and everyone has equal rights to live a happy life. it is wrong to explore and use others for seek of your pleasure because it causes suffering for others and eventually for youself. because it cause happiness for other and make good feeling for youself. Cherishing others is the wisdom that make yourself happy. By doing so, peace prevail in your own life and in your environment!! Limis are ethanic Tibetan with intact unique Tibetan culture, which is is serviving in the most remote area of northwestern Nepal. for educational opportunities and a better way of life. by building school for children, clinic for sick, and introducing alternative economic resources for the villagers. "to educate younger generation is an important responsibility for this generation. cycle of illiteracy and poverty in the region snf to make Limi a better place to live. Senge Tenzin was born on 29th of January, 1981, in Purang, in the western part of Tibet. His father's name is Migmar and mother's name is Bute. From age 6 to 12, he went to the Purang primary school. In 1990, he was ordained by the great Drikung Kyagu yogi, Konchok Norbu, at Gongphur monastery. His ordination name was Konchok Chisang. In 1993, he escaped from Tibet and joined the Jangchub Ling monastery, the central Institute of Drikung Kagyu Order, northern India. He studied for three years, mainly in Buddhist philosophy, Tibetan and English languages and memorized recitation texts. In addition, he received teaching from living masters of Drikung Kagyu Order, in Buddhist scriptures, tantric practices, initiations and empowerments. In 1994, on 15th of the first Tibetan month, Senge Tenzin was formally recognized as the reincarnation of the great Druptop (mahasiddha, or highly realized being) Senge Yeshi by His Holiness the Drikung Kyabgon Chetsang Rinpoche. Senge Yeshi was an awaked Yogi and was a close disciple of Kyobpa Jigten Sumgon, the founder of the Drikung Kagyu Order. His reincarnations have earned the title Limi Tulku, (the reincarnation of Limi). Between 1996 and 1999, under the guidance of the retreat master Druptop Yeshi, Senge Rinpoche stayed in a three year retreat, practicing "Four Preliminary Practices", "Fivefold Path of Mahamudra" and "Six Yoga of Naropa". This retreat system is a unique Kagyu tradition of Tibetan Buddhism and was funded by Drikung Kagyu Institute and His Holiness Drikung Kyabgon Chetsang Rinpoche. Click here to read detailed life story of Senge Rinpoche. In 2000, Senge Rinpoche went on a pilgrimage to the sacred Shel-Re-Drugda (Crystal Mountain) in the Dolpo, northeast Nepal. It is known that Druptop Senge Yeshi christened the Shel-Re-Drugda as the residence of the Dechog deity. The visit was advised and supported by His Holiness Drikung Chetsang Rinpoche. Since 2001, Senge has been running two Dharma centres in Taiwan. He also studies Chinese language. 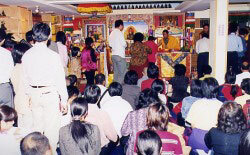 In 2003, Senge Tenzin Rinpoche visited Limi. It was the first reunion in his life time. Teachings and celebration kept going for three weeks. See the photos of Senge Tenzin Rinpoche and Limi people. 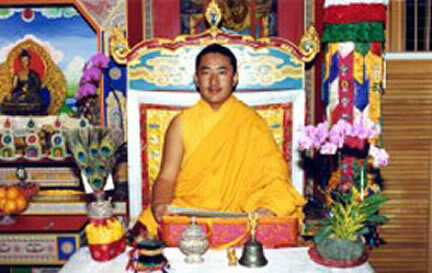 Senge Rinpoche has five monasteries, which were taken care of by his previous reincarnations. Now, it is his turn to maintain, develop the monasteries, educate the monks and accommodate the spiritual needs of the villagers in Tibet and in Nepal. So far, Senge Rinpoche has been providing a small scale support to the monasteries while he is undergoing his studies and running the two Dharma Centres in Taiwan. Senge Rinpoche wishes to take full responsibility for finding sustainable solutions for both the spiritual and financial requirements of his monasteries and people. - Gongphur monastery in Purang, western part of Tibet. Senge Rinpoche and Kailashzone have the following projects. We would like to request your contribution for our projects. 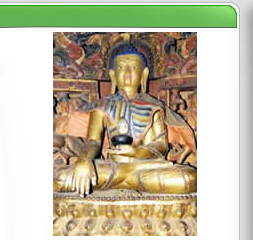 - Finding a sustainable financial solution for the monasteries of Limi.